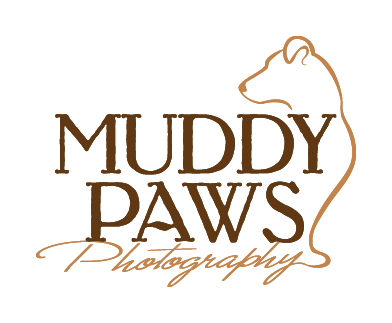 Muddy Paws Pet Photography is based in Evergreen, Colorado near Conifer and services the whole Denver metro area. I have studio access in the Denver area in addition to my main studio in South Evergreen. Your pre-session consultation: I will come to your home to meet you and your dog and discuss how the session will work. This is an important step with helping your dog to feel comfortable with me. We will also discuss the types of wall art that you are interested in and take pictures of the walls where you would like to hang your new artwork. Your session: I will usually hold your dog's portrait session in the studio but occasionally can hold the session on-location in your home. The session will not be rushed and will typically last about an hour because we want to make sure your dog is comfortable and relaxed. My sessions are fun for everyone so I can really capture the personality of your sweet pooch! Even if your dog is high energy or hasn't learned much discipline yet, I can still get great pictures of him. Really! Your ordering session: 1 to 2 weeks after your session, we will meet for your ordering session. Using state of the art software, we will design the perfect artwork for your walls by viewing your dog's photos at various sizes with various frames on your own walls (using the wall pictures we took at your pre-session consultation). You will find your ordering session to be very easy and comfortable. Contact Amy to discuss dates and to schedule your initial consultation. Want to see my gallery of some seriously cute doggies. Well here you go - just click right here! How do the pictures look on walls? Take a look at my room views page. Thinking seriously about it now? Click here to contact me!